Each Christmas, we usually plan a short family getaway to see something new and celebrate the season. We’ve gone to Christian music concerts, sought out Christmas light displays, and last year saw Mannheim Steamroller live for the first time. 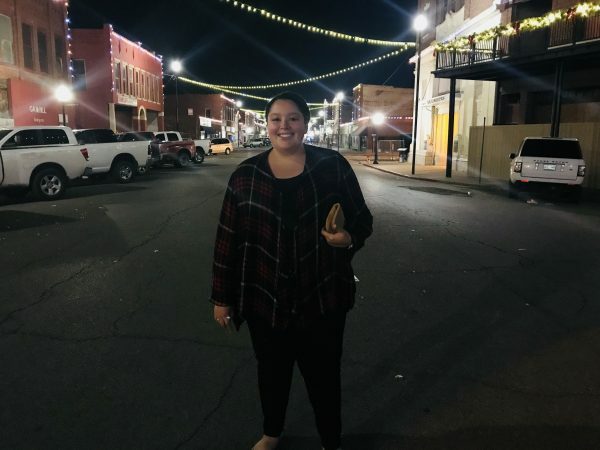 So, it was very exciting to add something new to our list of Christmas adventures and we’d heard so many good things about Pawhuska’s annual holiday lights parade. All ready to judge the parade! 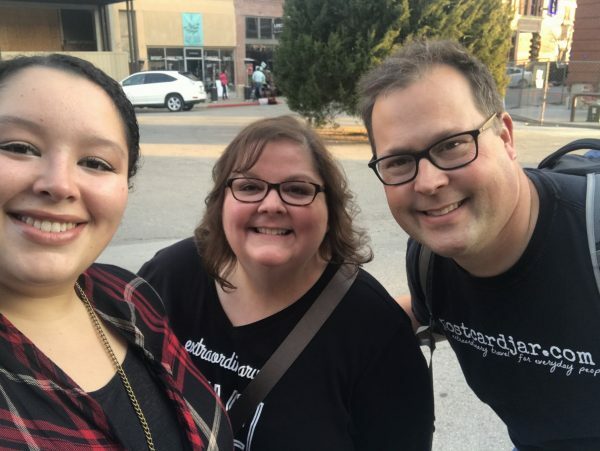 Our daughter, Meghan, was able to come with us and we enjoyed the time to reconnect on the 6-hour car ride from our home in Nebraska to the Oklahoma border. 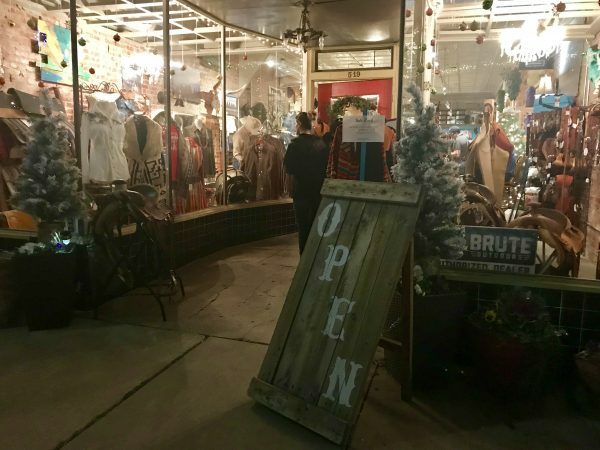 We got to town Saturday afternoon with just enough time to check into our room at the Historic Whiting Bed & Bath in downtown Pawhuska and stop by a few of the shops there, including the Tallgrass Art Gallery, Osage Outfitters, and LOREC Ranch Home Furnishings. It was Ladies’ Night at Osage Outfitters. 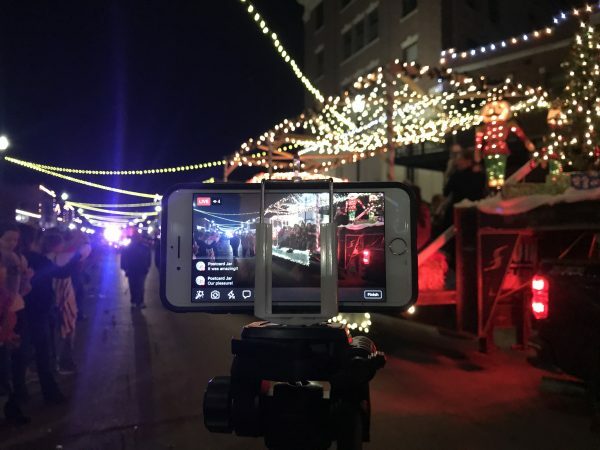 I took pictures and shot video of the parade while Steve and Meg judged the more than 30 entries, each covered in lights and exemplifying the theme of this year’s parade, The Nutcracker. It was fun to share our parade experience “Live” on Facebook. 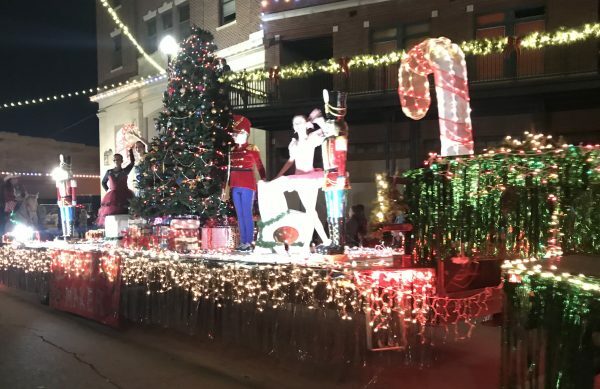 There were parade entries from businesses, non-profits, and even families who all just love celebrating the season and having a good time. 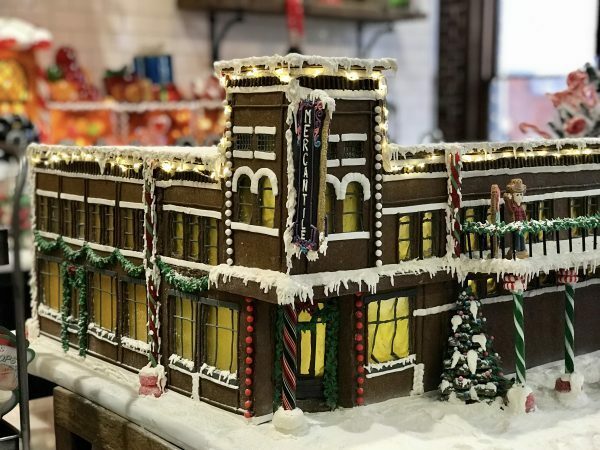 We had a late supper at The Pioneer Woman Mercantile and enjoyed doing a little Christmas shopping during the extended holiday hours that evening. 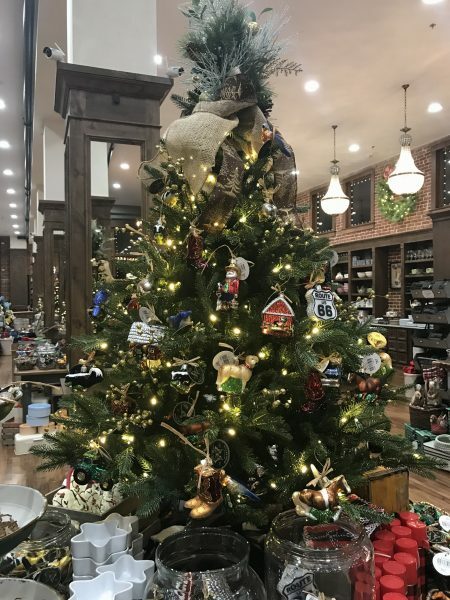 One of many trees at the Pioneer Woman Mercantile in Pawhuska. 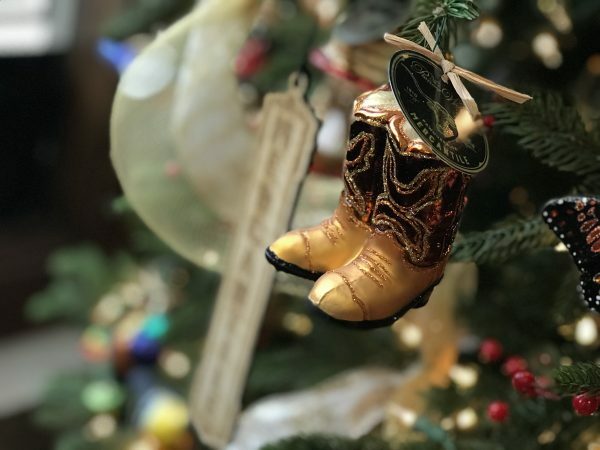 This pair of cowboy boots was another of the cute ornaments at the Pioneer Woman Mercantile. The Mercantile was beautifully decorated for Christmas, with several well-adorned Christmas trees, each with a different theme. There was one with food and cooking-related ornaments. The mini cinnamon rolls and KitchenAid mixer were a favs of mine. 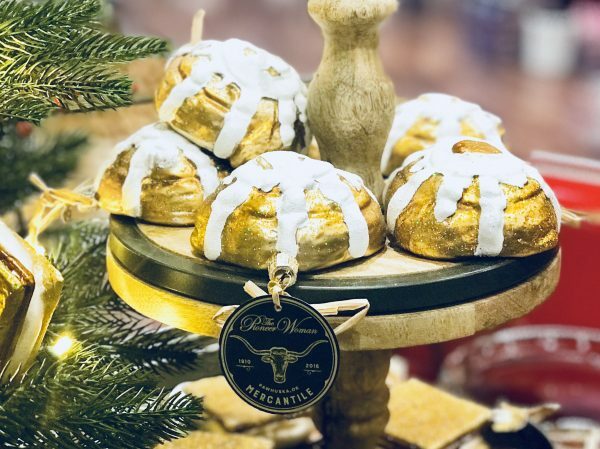 These cinnamon roll ornaments at the Pioneer Woman Mercantile look good enough to eat. 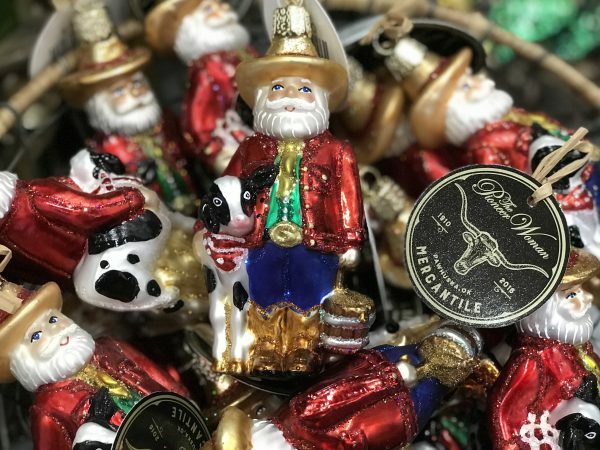 Another tree had a cowboy/ranch theme and had ornaments with things like cowboy boots, horses, dogs, barns, and John Deere tractors. 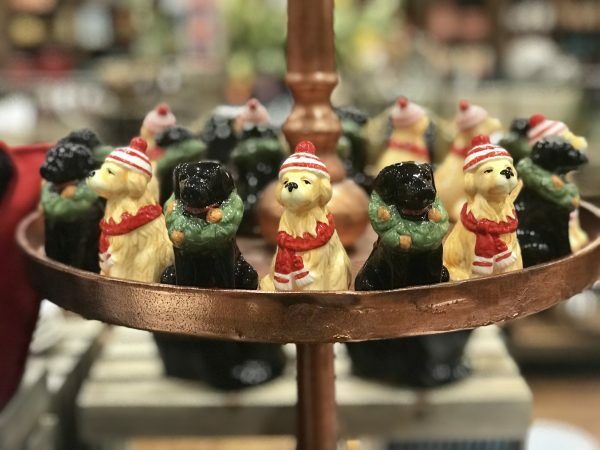 These cute pups at the Pioneer Woman Mercantile are a perfect Christmas gift for any dog lover. When we left The Mercantile, there were still a few shoppers in the streets and looking back at the strings of lights draping from building to building and hearing Christmas music played over a loud speaker downtown, we all felt like we were in the middle of a Hallmark Channel Christmas movie. I just love Christmas. I love my family. Pass the Kleenex, please. Meghan stands on Kihekah Ave. after the parade. The next day, we ventured outside and found a few local store owners working in their shops. We had a nice visit with the owner of Hair Razors and then spent quite a bit of time talking to the owners of the Book Burrow. 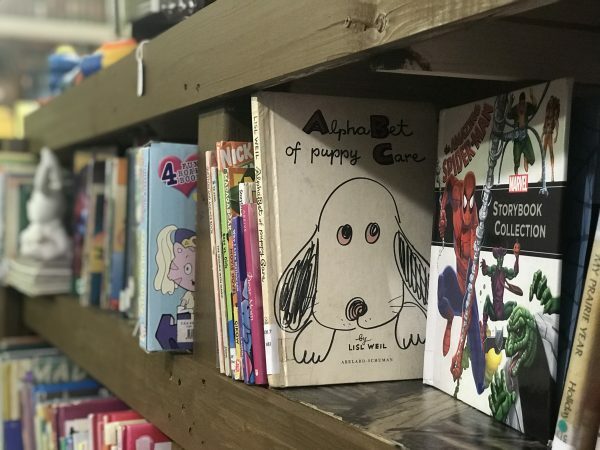 The (mostly) used book store is a great addition to downtown Pawhuska and they had so many interesting books on the shelves, along with some antiques and other household items. The Book Burrow in Pawhuska has a huge selection of used books including these children’s books. 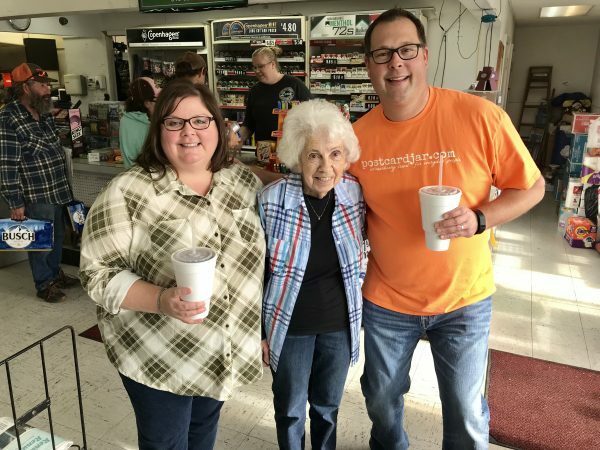 Of course, when in Pawhuska, you MUST stop at Handy’s, so we made our way over to our favorite convenience store to grab a cup of the best soda fountain pop in all of Oklahoma. We loved catching up with one of the owners, Martha, who was excited to tell us that our blog post about Handy’s a few months ago has helped business. She said several groups of people have even come in for a pop, saying they came to Pawhuska just to try the pop! It was nice to have a chance to catch up with Martha at Handy’s. We spent the afternoon touring the area, as there was still so much we had not seen on previous trips. We drove out to Grayhorse Cemetery and paid our respects to those buried there, many of whom we’d recently read about in the book, Killers of the Flower Moon by David Grann. It is an eye-opening and riveting book, if you haven’t read it. I highly recommend. We also visited the Shrine of Kateri, the Veteran’s Memorial, and had lunch at Buffalo Joe’s. Later in the day, we attended a worship service with a new church in town and then drove about 20 miles to Woolaroc for the Wonderland of Lights display. The Woolaroc Museum was beautifully decorated for Christmas. The grounds and buildings there were covered in 750,000 lights and it was an absolutely spectacular sight. 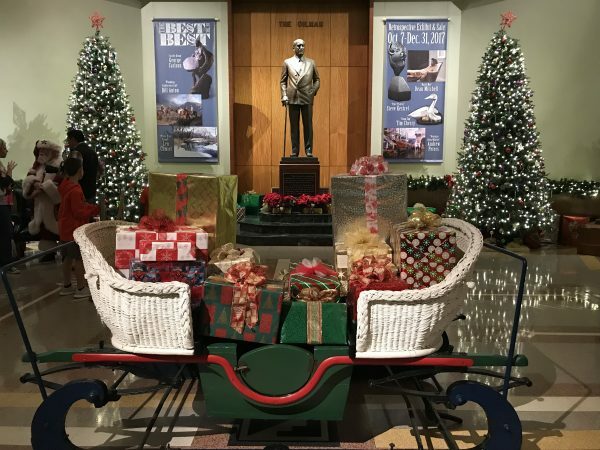 We enjoyed time in the museum and seeing Frank Phillips’ lodge all decorated for Christmas. Woolaroc has many incredible pieces of art. The next morning, we indulged in breakfast back at The Mercantile. It’s my favorite meal of the day and The Mercantile is quickly becoming one of my favorite places to eat it. Steve got the pancake breakfast this time. He says he thinks they are served with three big scoops of flavored butter to hold them down, as they are so light and fluffy, they might just float away without it. The pancake breakfast at the Pioneer Woman Mercantile. 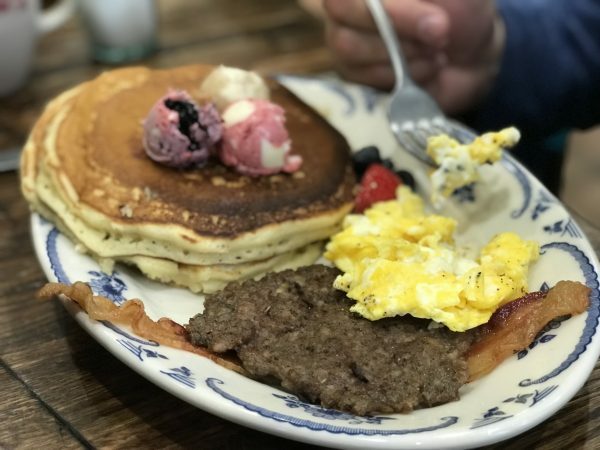 I love the farmer’s breakfast which includes eggs, tomatoes, breakfast potatoes, ham, bacon, freshly made sage sausage, and the most amazing, crumbly, melt-in-your-mouth buttermilk biscuit … my mouth is watering just typing this … that I’ve ever had. Oh, and it comes with blackberry jam. Needless to say, I can’t eat the whole thing, but it is nice to try a little bit of everything and there is no need for lunch. This gingerbread model of the Mercantile is full of beautiful detail, including a preview of the soon-to-be constructed balcony that will overlook Main St.
We took one more quick stroll through The Mercantile and picked up just a couple more gifts (who can resist the World’s Best Plastic Wrap & Dispenser) and headed down the street to visit a few more businesses. 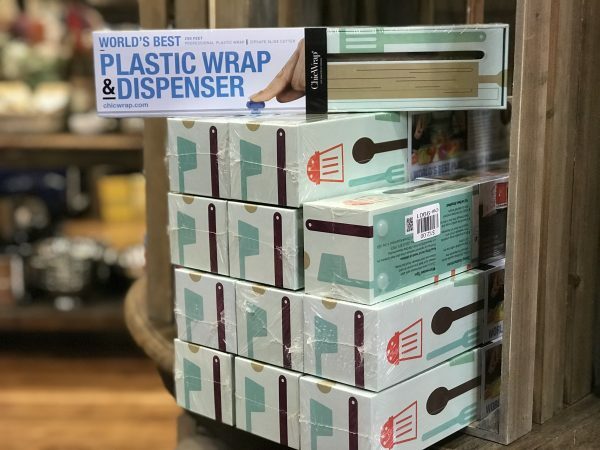 This plastic wrap dispenser at the Pioneer Woman Mercantile really is the world’s best. 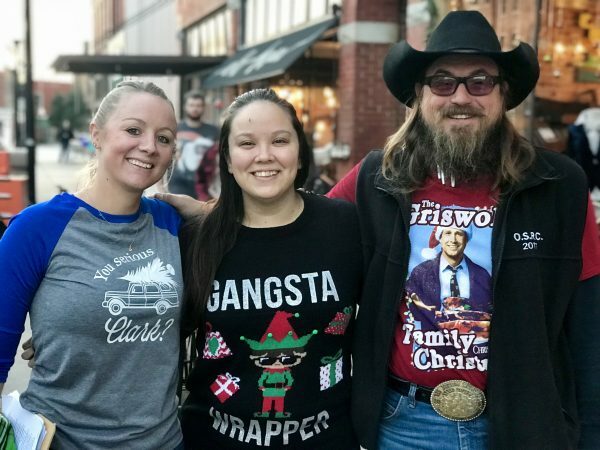 We were so delighted to finally meet, in person, the Trumbly family who own and operate Clifton’s Gift Shop just around the corner from The Mercantile. We were honored to be given this blanket by Mr. and Mrs. Trumbly of Clifton’s. We’d spoken with Teresa on the phone and were just honored to spend time with her and her family, hearing about the history of Pawhuska and learning about the Osage Nation. 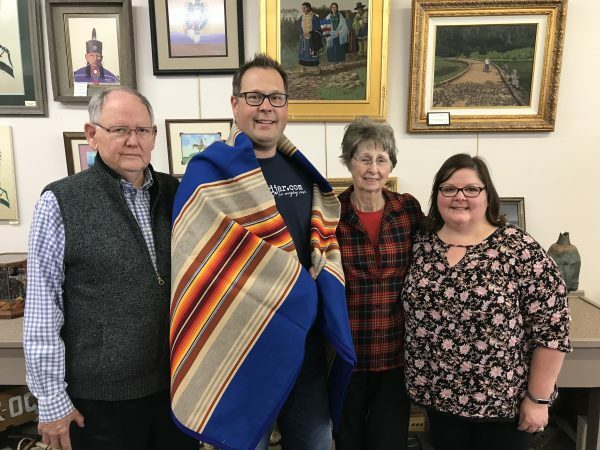 We spent more than an hour visiting and then, Mr. and Mrs. Trumbly presented us a with a generous gift – a beautiful Pendleton blanket. We were so touched by the gift and are honored to display it in our home. They were also so kind to set up an impromptu meeting for us with Osage Nation Chief Jeffrey M. Standing Bear. After one last stop at the Waterbird Art Gallery, we filled up our drinks at Handy’s and headed home. Until next time, Pawhuska, thanks for your genuine hospitality. 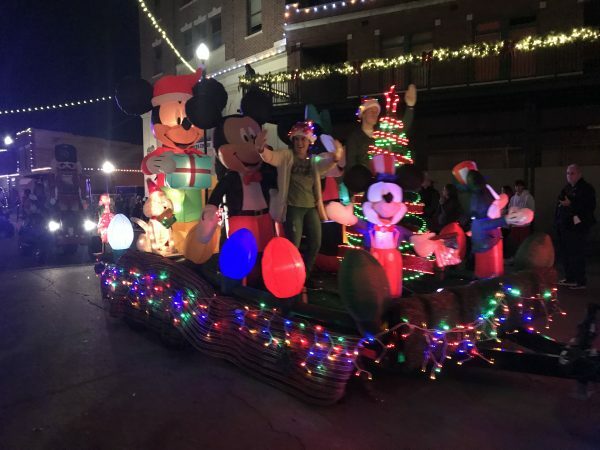 Have you been to Pawhuska’s Holiday Lights Parade? Tell us about it. We’d love to hear from you. Ann – I loved your post. We are planning a visit to Pawhuska the week before Christmas this year. Can you tell me if there is generally a lot of snow in December? I know each year is different, but do you think we would encounter a ton of snow? We were told when we moved here that there was no need to buy a shovel. 🙂 Everyone here has said they get a dusting now and then, but nothing much to worry about. Hope this helps. We were here in Pawhuska the first week in December 2017 and it was really nice. Just needed a light jacket for the holiday parade of lights. Let us know if you get to Pawhuska. We’d love to meet you! Enjoyed your article! Hope to visit Pawhuska, it’s on my bucket list! So glad you liked the post. We can’t say enough good things about Pawhuska. 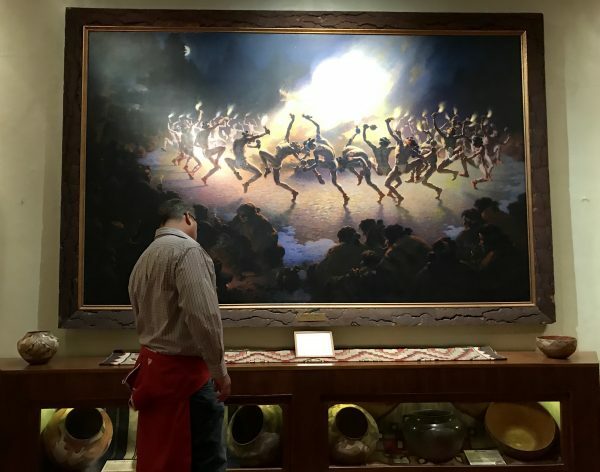 Be sure to check out our post on 70+ Things to Do in Pawhuska when you go. There is so much history, art, and fun there! Travel well. 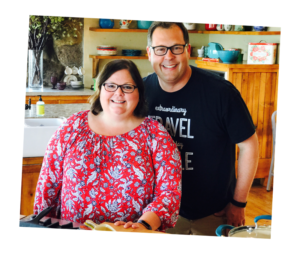 Great post–and wonderful people in Pawhuska. Thanks, Gayle. You’ll have to come back at Christmastime. It was magical! Thanks so much for posting. Love all the pictures. I will be there next summer. Have a great Christmas. Our pleasure. Glad you enjoyed the post. We’ll be posting more pictures on our Postcard Jar Facebook page, as well. It was just so beautiful! Merry Christmas to you, as well.